Rabbit anti Human, Mouse, Rat ATF2. 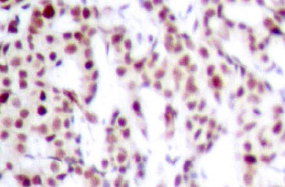 Product is tested for Immunoprecipitation, Western blot / Immunoblot, Paraffin Sections. Eukaryotic gene transcription is regulated by sequence-specific transcription factors which bind modular CIS acting promotor and enhancer elements. The cAMP response element (CRE), one of the best studied of such elements, consists of the palindromic octanucleotide TGACGTCA. 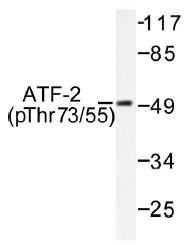 Several CRE binding proteins have been identified within the ATF/CREB family, the best characterized of which include CREB-1, CREB-2 (also designated ATF-4), ATF-1, ATF-2 and ATF-3. These proteins share highly related COOH terminal leucine zipper dimerization and basic DNA binding domains but are highly divergent in their amino terminal domains. Although each of the ATF/CREB proteins appear capable of binding CRE in its homodimeric form, certain of these also bind as heterodimers, both within the ATF/CREB family and even with members of the AP-1 transcription factor family. 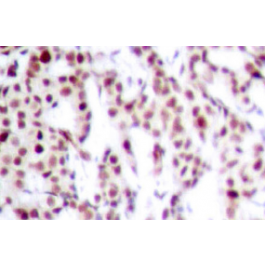 p-ATF2 (pThr73/55) antibody detects endogenous levels of p-ATF2 protein.